For the purposes of this study, you only need to learn to identify the males of the 6 species marked with an asterisk. Use this page in addition to the guide we will send you. 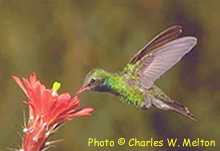 On this page, you can also learn about other hummingbirds of the West if you wish. A few of these are seen in Tucson occasionally. * Species found in urban Tucson. These are listed by level of abundance from the very abundant to rare. ~ First report in Tucson on January 2005. Special thanks to the photographers for permission to use their pictures. You may link to their web sites by clicking the pictures.